The infamous Gunpowder Plot conspirator, Guy Fawkes, who planned to blow up the Protestant King James I and the Houses of Parliament, was born in York in 1570. The church registers of St Michael le Belfrey, High Petergate record he was baptised at that church on 16 April 1570. 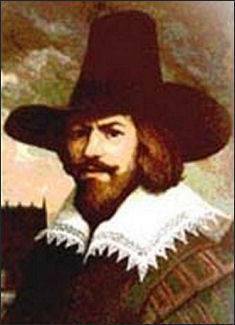 Guy Fawkes was the second of four children born to Edward Fawkes, a proctor and an advocate of the consistory court at York, and his wife, Edith Blake. His father died when Fawkes was eight years old, after which his mother married for a second time to Denis Bainbridge, a recusant Catholic. Fawkes later converted to Catholicism, he attended St Peter's School in York and two of his former schoolfriends, John and Christopher Wright were also involved in the notorious Gunpowder Plot. 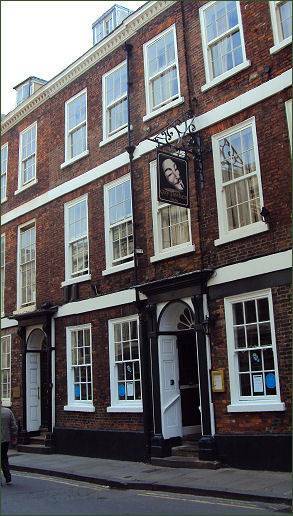 There are various claims as to his birthplace, particularly with regard to a small cottage at the back of what is now the Guy Fawkes Inn, on High Petergate, where Fawkes' mother is claimed to have lived. The Inn is situated opposite St Michael le Belfrey Church and dates to the early eighteenth century, although there is evidence that earlier structures occupied the site. By 1604, Fawkes had joined Robert Catesby's group of English Catholics, who were plotting to assassinate the Protestant King James I, most of the Protestant aristocracy, and the bishops of the Church of England, using gunpowder to blow up the Houses of Parliament while the king was attending. Robert Catesby rented a house right by the Houses of Parliament, from which the conspirators dug a tunnel to the undercroft of the House of Lords into which they smuggled thirty six barrels of gunpowder. This was to be the prelude to a popular revolt in the Midlands during which James's nine-year-old daughter, Princess Elizabeth, was to be installed as the Catholic head of state. Several of the conspirators expressed worries about the safety of fellow Catholics who would be present in Parliament on the day of the planned explosion. Their well laid plans went awry when one of the conspirators decided to warn a Catholic friend, Lord Monteagle, due to sit in the House of Lords on the appointed day, not to attend. Alarmed, Monteagle promptly rode to Whitehall, and delivered the unsigned letter to Lord Salisbury, the Secretary of State. Salisbury arranged a search of the cellars at the Houses of Parliament and Fawkes, dressed in a cloak and hat, and wearing boots and spurs, was arrested on the spot with both matches and touchwood in his possession. The barrels of gunpowder were discovered hidden under piles of faggots and coal. On arrest he gave his name as John Johnson. Guy Fawkes was sent to the Tower of London and although he admitted his own guilt, he refused to name any of his co-conspirators. He was removed to the White Tower of the Tower of London , where he was placed in the dreaded dungeon of Little Ease, beneath the Chapel of St. John. This chamber measures only four feet square and kept any occupant constantly on his feet. Of those involved, some were shot as they were chased by the law such as Percy and Catesby. With a small group of followers, Catesby made a stand at Holbeche House in Staffordshire, against a 200-strong company of armed men. He was shot, and later found dead, clutching a picture of the Virgin Mary. As a warning to others, his body was exhumed and his head exhibited outside Parliament. Others were captured, sent to the Tower and, after a brief trial, eventually hung, drawn and quartered, with Fawkes, in January 1606. Before his execution on 31 January, Fawkes jumped from the scaffold where he was to be hanged and broke his neck, thus avoiding the agony of the mutilation that followed. The Georgian-fronted Guy Fawkes Inn displays a blue plaque on its exterior wall stating that Guy Fawkes was born there in 1570 but his birthplace may have been in nearby Stonegate, as another blue plaque proudly proclaims. claims. All that can be said with certainty is that Fawkes did live in the area. The Inn, which underwent extensive refurbishment in 2008, offers accommodation, serves real cask ales and traditional pub fare.